What do you call a group of blacks in an ocean? Thus goes an African Joke. Black is beautiful. But Africans are definitely not aware of that. A recent study by the University of Cape Town suggests that one woman in three in South Africa bleaches her skin. The perennial inferiority complex about their skin color has pushed the African Community living in Western countries to self-declared territory of isolation. Africa is not a country but a continent of 54 sovereign nations. 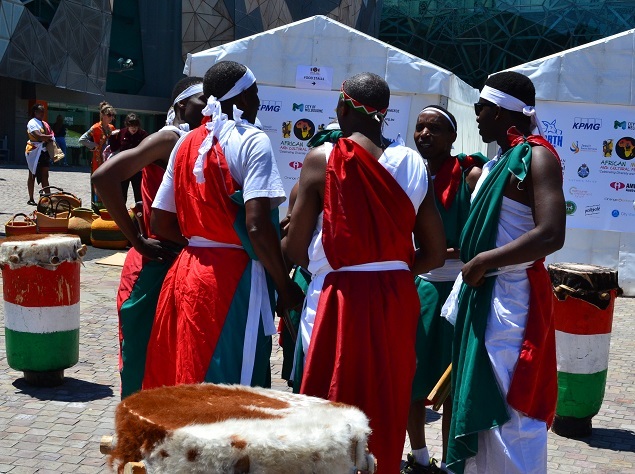 Due to the huge size of the continent, I was expecting a large oil spill at the Federation Square for the African Festival. But I was wrong. At best it was oil drops here and there. This made my friend suggest that most probably they are holed up somewhere planning the next house break in or carjacking. As a community the Africans have made a very bad name in Melbourne. 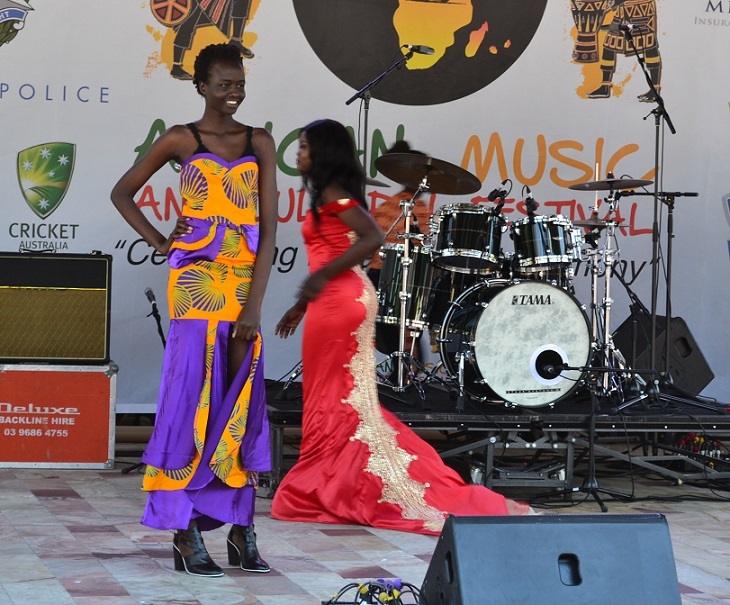 The South Sudanese Refugees in Melbourne, even prompted the Government to rethink whether it is worth taking in refugees any more. They were a menace to Australia bringing in the culture of their war torn nations and troubled past, which they were supposed to leave behind. 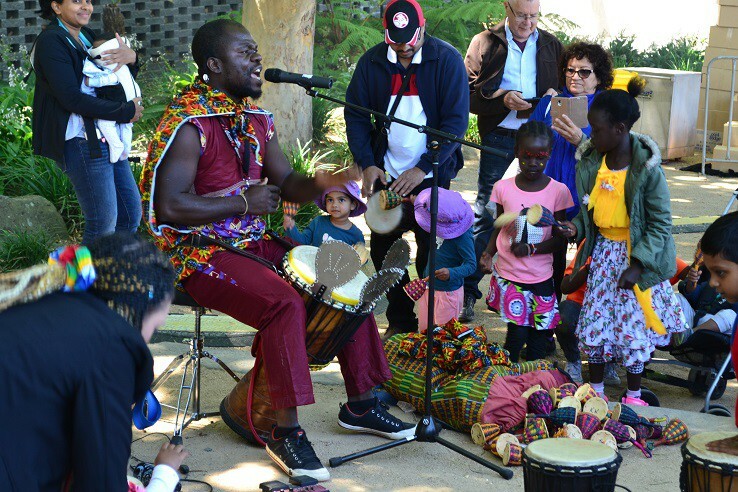 But the atmosphere at the African Cultural Festival painted a different picture. 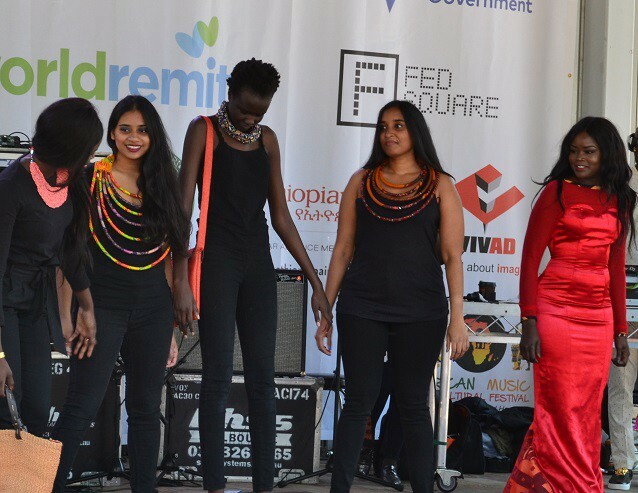 It was all smiles and a happy bunch of people willing to display their art, culture and culinary skills and even trying to impart their drumming skills. As I interacted with them, it was getting clearer and clearer that how much the western influence has poisoned our minds and outlook. The media brainwash has turned an entire generation of human beings to think in a typical way on what is right and what is wrong and what is good and what is bad. How do you keep a black youth off the street? Keep a KFC on the sidewalk. So says another African joke. 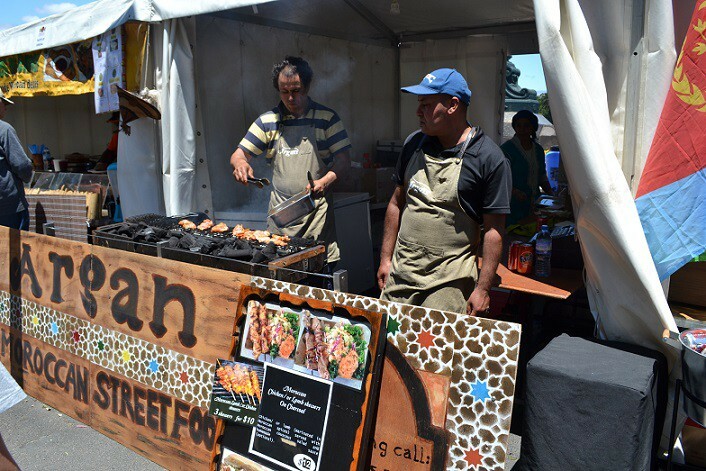 I went down through the stairs of Federation Square to the Princess Walk, Where African foods stalls were selling traditional African cuisine. There were more chicken than anything. Apart from the humour probably there is some truth in the above said African joke. Now I am confused, what should I try. I wanted something more traditional than most. My Great Grandmother always said, “If you are confused, just google it” and I did just that and a long list has come up. I could find Cape Breyani and Koshari. But by the look of it, they were not that inviting for my tastebuds so I decided to give it a miss this time. 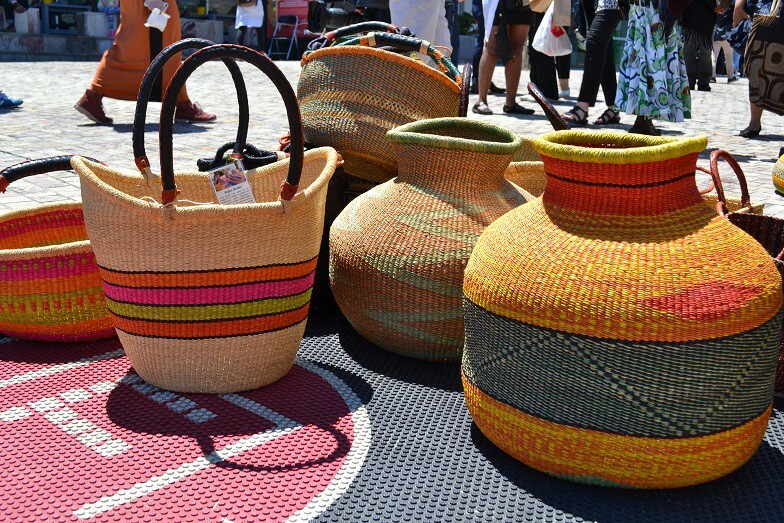 My next stop was at the stalls selling African artefacts – mostly hand bags and that sort of stuff. They all looked good and I must say very photogenic. Did I buy anything? Stinginess, I inherited it from my father’s side of the family and one should never say ‘no’ to inheritance. 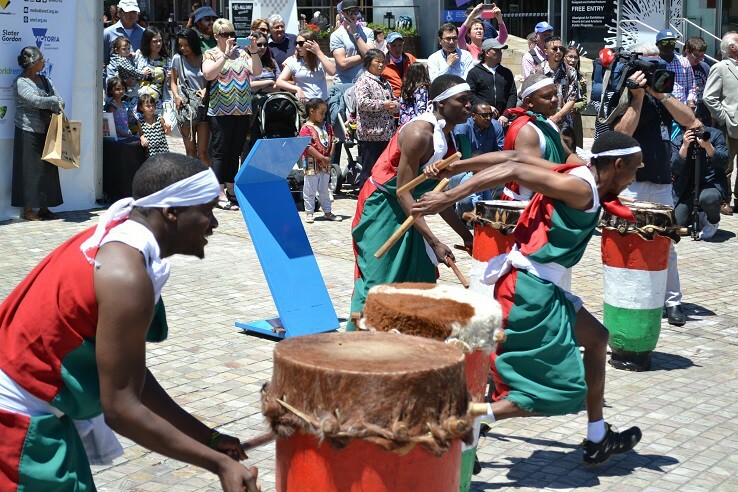 That was followed by stalls selling African Tours and Travels from Egypt to South Africa. Something was drawing me towards taking a trip to the African Continent during the rather large Christmas break I am having this year. Then suddenly a visual image from Africa Geographic’s “17 of Africa’s funniest signs” has come up in my mind. Am I really planning to go to Africa this summer? Fear, I inherited from my mother’s side of the family and I never say ‘no’ to inheritance.